The Lawns Holiday Home01263 710144work Self-catering"	Probably the best possible location in North Norfolk - central Holt - highly sought after.
" 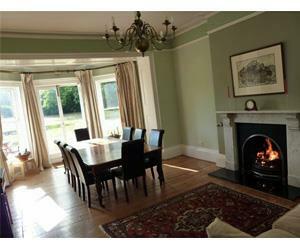 Gorgeous and huge house (very warm due to new powerful central heating system), lovingly and tastefully restored, with no expense spared.
" Zoffany and Willam Morris wallpapers, antique furniture, brass, marble and granite. Our accountants tell us that we spent £165k on restoration and fittings, this is not counting the value of slave labour used (friends and family).
" Nearly 2 acre garden, with huge formal lawn and a play area with a large trampoline and table tennis.
" Modern large kitchen with John Lewis appliances, full selection of cooking utensils. If anything is missing for your dish (very unlikely) - tell us and we will provide it there and then.
" Excellent value for money, as we do bookings directly which allows us to save costs, unlike most cottages who have to pay the agency overhead.
" There is enough sleeping space for up to 10 people.
" Lots of repeat business. Come and discover us for yourself! "A spacious, well equipped and perfectly located house. Our second time here and it was every bit as good as we remembered it..."
"We had a superb time. The dining and living areas are fantastic. One of our party booked immediately for another break..."
"	Probably the best possible location in North Norfolk - central Holt - highly sought after.